Melissa has been with UC CalFresh since 2013. 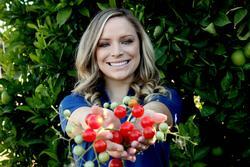 She discovered her passion for nutrition education as a volunteer for UC CalFresh. After graduating from Cal Poly with a Bachelor’s in Nutrition, Melissa quickly started as a Community Education Specialist. Melissa enjoys working with youth, especially the Student Nutrition Advisory Council where she encourages youth engagement and gets to see the youth achieve their goals. She is also the physical activity lead for our county and is certified to train in CATCH P.E. When Melissa is not at work, she enjoys time with her family and her black lab, Lexi.